Flexamat consists of concrete shapes, locked together with a high strength, polypropylene geogrid. There are openings around each concrete block that give Flexamat the flexibility and enable it to be packaged in rolls. The openings also allow vegetation to grow through the mat. Eventually, vegetation will completely cover Flexamat. It can be manufactured with various backings such as non-woven fabric to stop vegetation growth or a TRM (turf re-enforcement mat) depending on the soil conditions and other factors. [embed]https://www.youtube.com/watch?v=pYNLVdt6bhM[/embed]FLEXAMAT INSTALLATION GUIDELINES Flexamat® is shipped on flatbeds. Approximately 4600 square feet can be hauled on each truck. When possible, spot the rolls to improve efficiency. An excavator is the best machine to lift and install Flexamat® rolls. Backhoes can be used as well but an excavator is more efficient and performs better. Often it works well for a large excavator to lift and set the Flexamat® rolls in place. Then, use a small excavator to work in the channel to unroll the roll. A smooth bucket on the excavator works the best. If a "toothed" bucket is the only option, care must be taken not to gouge the material. The next set of pictures show each step of a stream bank stabilization project. Underlayment Options Standard Flexamat® is manufactured with Curlex® II underlayment backing. It may also be manufactured with Recyclex® TRM or non-woven filter fabrics. Onsite conditions and project requirements determine the appropriate underlayment material. There's a wide range of applications where Flexamat is utilized, but it is most commonly used for erosion control. Flexamat is used to control erosion in channels, outlet protection, on slopes, for shoreline protection and many other applications. Permanent Solution - will not crack with freeze / thaw cycles. Easy Maintenance - can be mowed over with commercial mowing equipment without turf damage. Fast and Simple Installation - roll design makes installation efficient. Reduces Construction cost - low material cost, less labor, and shorter lain closure time. Reduces runoff velocities - 0.055 Manning's "n" value. Natural and Aesthetic Solution - insulates from cold and heat, and allows pet and owner access. Improves Safety - no loose blocks that can be thrown or cause slippage. Permanent Solution – will not crack with freeze / thaw cycles. Easy Maintenance – can be mowed over with commercial mowing equipment without turf damage. Fast and Simple Installation – roll design makes installation efficient. Reduces Construction cost – low material cost, less labor, and shorter lain closure time. Reduces runoff velocities – 0.055 Manning’s “n” value. Natural and Aesthetic Solution – insulates from cold and heat, and allows pet and owner access. Improves Safety – no loose blocks that can be thrown or cause slippage. There’s a wide range of applications where Flexamat is utilized, but it is most commonly used for erosion control. Flexamat is used to control erosion in channels, outlet protection, on slopes, for shoreline protection and many other applications. Mat Width & Length Manufactured in standard widths of 4′, 5.5′, 8′, 10′, 12, & 16′. Lengths can be cut to order per project requirements. Stocked lengths are 30′, 40′, & 50′. 4′ x 4′ mats stacked on pallets are also available. Block Size The concrete blocks are 6.5″ x 6.5″ x 2.25″. There is 1.5″ spacing between the blocks. Flexamat® is shipped on flatbeds. Approximately 4600 square feet can be hauled on each truck. When possible, spot the rolls to improve efficiency. An excavator is the best machine to lift and install Flexamat® rolls. Backhoes can be used as well but an excavator is more efficient and performs better. Often it works well for a large excavator to lift and set the Flexamat® rolls in place. Then, use a small excavator to work in the channel to unroll the roll. A smooth bucket on the excavator works the best. If a “toothed” bucket is the only option, care must be taken not to gouge the material. 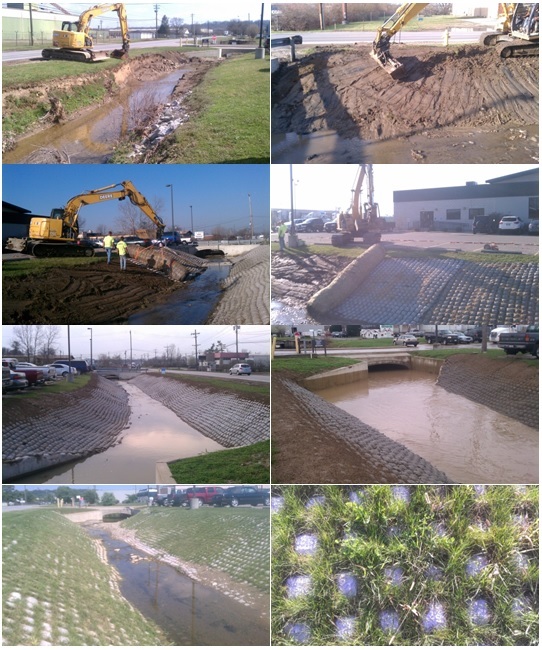 The next set of pictures show each step of a stream bank stabilization project.